Mozart, Beethoven, Bach, Chopin, Pachelbel. They are some of the classical music masters who have made great music masterpieces. Their names are also, most of the times, instantly associated with the yesteryears and it is a common conception that only people of older generations can relate to them. That’s where Adil Mills enter. Playing Mozart’s Requiem Mass is not an easy task. Experienced piano players may have difficulties with the piece. However, Adil Mills has no problems with playing Requiem Mass – on an electric guitar! This 25-year old man plays classical pieces on his electric guitar. A definite guitar hero material, here’s our interview with this musical genius. You have an unusual way of playing the classical masterpieces, how did you get to this kind of thing? I was not really into classical music before. During my high-school years, I was part of a school band where we play punk-pop genre. One time, my friend tricked us into watching this Korean love story movie titled My Sassy Girl. One of the dramatic scenes was when the main character played a piano piece to his girlfriend. The song kept playing in my head – even after the movie. So I searched for the songs and later on learned that it was Pachelbel’s Canon in D. The piece has become my first favourite classical music. After a few months, I saw a Youtube video of Sung Ha Jung playing the Canon in D using his electric guitar. The video sparked a shift into what I am doing now. Interesting. I understand that you have a regular day job and with all these classic-music-slash-electric-guitar-version, do you still have time to do some hobbies? Or is playing the guitar your only interest? Aside from playing the guitar, I also love my cats. I have four of them at home. I used to go to Casinos but has not been able to go on one for the past three months due to my busy schedule. Now, I would just go to OLC to play black-jack - or roulette online, make money by gambling, and play poker online. The Guitar Hero series on Jemsite features interviews with guitarists and musicians who may not have star status YET, but their current situations have shaped them to be who they are--determined, fond of their craft, and heroes in their own right. Perhaps you'll see in these upcoming entries the next Jimi Hendrix, Melissa Etheridge, or Duane Allman. Or perhaps they'll become household names by doing what they do best--ripping a mean riff! 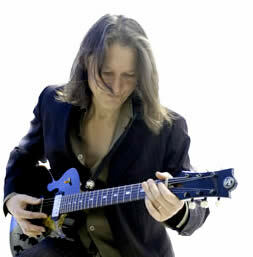 Robben Ford has played with jazz great Miles Davis, calling it a moment that was like "passing through Knighthood." If you don't think that's cool enough then ponder this: Robben also played with The Beatles rocker George Harrison on George's personal tour when he was just 22 years old! If that's not enough, Robben has also played with Joni Mitchell, Bonnie Raitt and many, many others. But that's not what makes Robben so cool. Chalk it up to his peseverance as a young guitar player (his dad taught him a few chords but he mostly learned to play guitar by himself) and his current reputation as one of the premiere electric guitarists today...and you're onto something! We had the privilege of interviewing this incredible guitarist for Jemsite. Let's see what he has to say about his skill. My father played and showed me my first few chords. I learned quickly and was given my first electric the following Christmas and started a band with my thirteen year old friends. Perhaps he's not a guitar player in the way that Steve Vai or any of our past guitar heroes are guitar players. In fact, Andrew Durkin, a self-taught guitarist, doesn't use it for instrumental music at all. Instead, he uses it to compose songs with vocals. Nevertheless, I felt compelled to call him a guitar hero because of the very unique way he uses guitar as well as his infatuation with jazz music, a genre that certainly doesn't get enough credit. Andrew Durkin holds court as a composer on the West Coast (mainly Portland, Oregon) where the scene is ripe for his self-proclaimed "wacky LA-based acoustic jazz monstrosity, the Industrial Jazz Group. 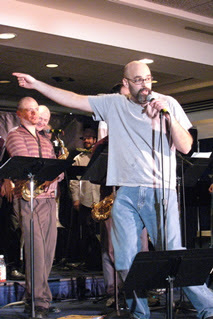 He also counts himself as a huge Frank Zappa fan, has written a rock opera, and a screenplay among other scores, and has studied composition in his lifetime. Now we're here to find out what the deal is with that jazz music concept. Is it really the music of unemployment, as he refers to it on his blog? You'll be sure to learn what he means below, as well as just how much time he spends on guitars and music. The Rock House Method is a guitar and music resource created to enrich musicians and music lovers through a variety of effective products, tools, and communities. We're a big fan of The Rock House Method and their products. That's why we're thrilled to mention a new way you can download Rock House products rather than purchase them in a store. It's a HUGE step in the internet world. As many of you know Rock House Method launched a new service called ROCK HOUSE ON DEMAND. Executive Director of Rock House, Joe Palumbo announced that he wants to give every one an opportunity to experience this exciting new venture for Rock House. Right now you can save $10 off the purchase of any Rock House product by using this code ROCK10OFF. We will also throw in an additional $5 coupon code for another purchase of a product from ROCK HOUSE ON DEMAND. The second savings coupon code will be included on your receipt after you make your purchase using the ROCK10OFF coupon code. You can share this code with all your friends who play, so go ahead and pass the ROCK10OFF coupon code around. Frankfurt's massive 2010 Musikmesse show witnessed the unveiling of the new Ibanez Steve Vai signature model. The Jem77FP2 features goodies galore, with a basswood body - with iconic Monkey Grip handle- covered with a unique patterned fabric displaying a stunning floral effect under a high gloss finish. The 77FP2 has a five piece Jem 'Prestige' maple/walnut neck and rosewood fingerboard inlaid with a floral design, whilst pickups are high output DiMarzio Evolution models. JEM fans were also knocked out by Vai's multi-coloured limited edition Ibanez UV77RE. This 7-string beastie, like the 77FP2 has a basswood body, but with a five piece maple/bubinga tonewood neck construction and a rosewood fingerboard with 'disappearing pyramid' inlaid position markers. Housing seven-piece Dimarzio Blaze pickups, again in humbucker, single coil, humbucker configuration, expect the UV77RE to take no prisoners in the subtle department. 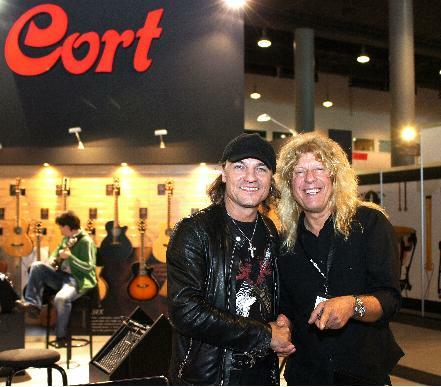 Few people are aware that Cort have been building guitars for over 50 years, now producing over a million a year, with a host of high profile endorsees. Latest in the line up includes non other than Matthias Jabs of the Scorpions, who after a short collaboration the Korean company has introduced two signaturemodels, and chose this year's show to launch the twin horned solid bodied electric guitars.